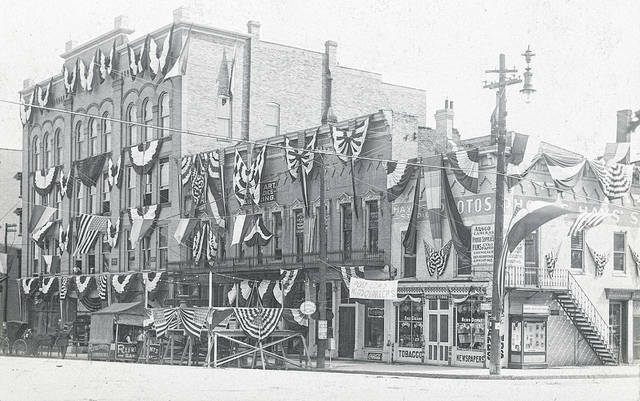 Leland’s corner decorated for Fayette County’s centennial celebration in 1910. In 1898, Benjamin Franklin Leland moved with his wife Annie and their four children from Jeffersonville to Washington Court House after the Western Union Company named him to succeed W. A. Teter as manager of the local telegraph office. In Jeffersonville, he had been the telegraph operator, freight agent, and ticket agent for the Ohio Southern Railroad. 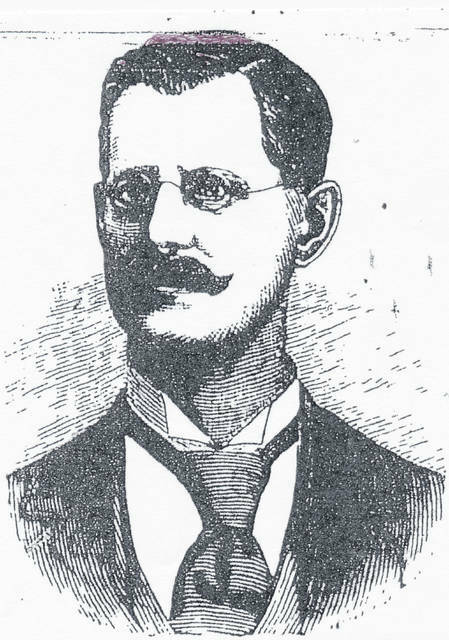 Soon after moving to Washington C. H., he purchased Teter’s newsstand at the southwest corner of Court and Main streets and renamed it Leland’s News Depot in deference to his previous work first as a railroad conductor and then as a railway agent. He expanded the store’s line of merchandise to include not only newspapers, magazines, candy and tobacco but also greeting cards, sporting goods, insurance, fireworks, postcards, and sheet music. The News Depot stocked more than 1,000 pieces of sheet music. During Fayette County’s week-long centennial homecoming in 1910 and when Washington C. H. hosted Ohio’s Grand Army of the Republic (GAR) encampments in 1905 and 1913, a large banner in front of the store proclaimed it to be the events’ “postcard headquarters.” As the Fourth of July approached each year, the store sold hundreds of firecrackers, sparklers, and Roman candles. Leland also wholesaled fireworks to other stores in the county. The Western Union office was located on West Court Street directly behind the News Depot. It became a center of community activity during the Spanish American War (April-August 1898) and World War I (1914-1918) because war news was posted in the window as soon as it came in over the wires. Leland and his three sons—Ed, Ben, and Arthur (my grandfather)—were all accomplished telegraphers. Son Ben had an unusually keen aptitude for copying and sending Morse code. For several years, he was Western Union’s chief telegrapher in Boise, Idaho. B. F. Leland relinquished the Western Union franchise in 1923 after reaching the company’s mandatory retirement age of 70. He had been a telegrapher for 53 years. In the dark early morning of Dec. 30, 1911, a horrific fire began in the basement of the Masonic Temple building on South Main Street. The fire spread quickly and destroyed all of the buildings except one on the west side of Main Street between Court and East streets. Only the News Depot at the block’s north corner remained unscathed. In 1922, Leland moved his emporium to 143 N. Main St.—-to the room adjacent to the former Courtview restaurant. Esther Tyler Leland, B. F. and Annie Leland’s only daughter, clerked in her father’s store before marrying and moving to St. Louis in 1932. She was widely known and much liked for her friendliness and cheerful disposition. Leland’s store was a busy place on Saturday evenings since a century ago the uptown businesses stayed open on Saturday until 9 p.m. For the first half of the 20th century, Washington C. H. was a bustling “Saturday night town.” Many of the customers who came to the store on Saturday returned the next day to buy the Columbus and Cincinnati Sunday newspapers, which in 1922 sold for a dime. The B. F. Lelands lived at 512 S. Fayette St. Money from the day’s transactions was taken home each evening in a large leather bag and counted on the dining room table. Benjamin Franklin Leland died in 1928. Esther Leland ran the business until 1932 when the family sold it to J. M. Weishaupt, manager of the Fayette Coca-Cola Bottling Company. Marion “Dutch” Rife purchased the store from Weishaupt in 1936 and returned it in 1951 to its original location at the corner of Court and Main streets. In 1953, Rife sold his newsstand and sporting goods center to Ralph Bray, who operated it until 1972. The next owner was Merrill “Mutt” Lynch, and the last owner was Dora Beucler. The store closed permanently in 1998.
https://www.recordherald.com/wp-content/uploads/sites/27/2018/07/web1_Leland.jpgLeland’s corner decorated for Fayette County’s centennial celebration in 1910.